File photo of Tracy Guerrette powering up Union Street hill during the 55th annual Bangor Labor Day 5 mile road race in 2017. Guerrette finished 25th among women at the 2018 Boston Marathon. She spent 10 minutes shivering in the recovery tent after the Boston Marathon before some attendants came over to help her get out of her wet, frozen clothes and warm up. But St. Agatha native and former Wisdom High School and University of Maine basketball standout Tracy Guerrette had a memorable performance as she finished 25th overall among the 13,391 female entrants with a time of 2:54:02. 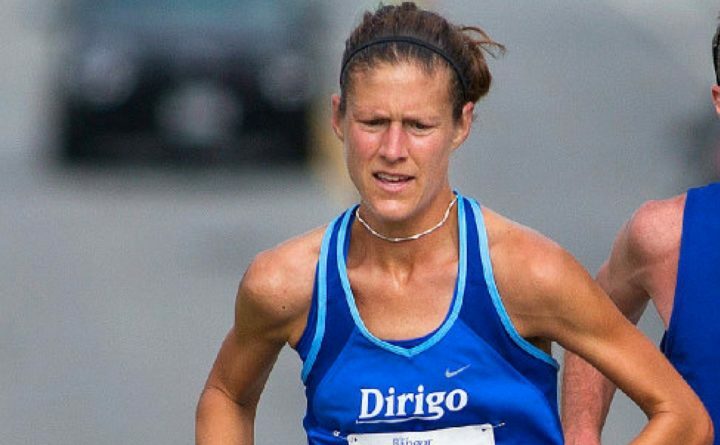 She was also the first finisher among the women from Maine and turned in her best time in her three Boston Marathons. The other top five Maine women were Heather Eaton, 25, of Gray (3:20:30, 864th) and Renee Durgin, 44, from Scarborough (3:22:18, 1,005th) followed by Johanna Stickney from Gardiner (3:26:46, 1,456th) and Karen Fogg from York (3:27:45, 1,572nd). Bar Harbor’s Rebeccah Geib was sixth at 3:29:01 which left her 1,583rd among the women’s field. Thomas Pore, 37, of Saco was the leading finisher among Maine men with a time of 2:42:33, which was 196th overall. Greg Fullman, 30, of Scarborough, was next at 2:46:55 (362nd) followed by Joseph Satterfield, 40, of Bowdoinham (2:48:09, 438th), Craig Nale from Freeport (2:50:44, 605th) and Crow Norlander from Portland (2:52:01, 697th). There were 174 Maine entrants and the temperature was 38 degrees at the start of the Boston Marathon. Guerrette, who lives in Bangor and is the director of faith formation at St. Paul the Apostle Parish, said the cold, rainy, windy conditions were the worst she has ever competed in. “We were running into a headwind for the entire race and it gusted up to 30 mph,” Guerrette said. “We had torrential downpours off and on. It was so cold. My feet were completely frozen. My hands were completely frozen. Despite the conditions, Guerrette said she loved it. “It was Boston. It was epic. It was an awesome experience,” said Guerrette, who added that she felt “good” after thawing out. It was an incredible day for American runners, especially the women. Desiree Linden became the first United States woman to win the Boston Marathon since 1985 with a time of 2:39.54. American Sarah Sellers was second in 2:44:05 and Americans took six of the top seven places and seven of the top 10. The American men earned six of the top 10 spots. “It was amazing,” said Guerrette, who earned elite status for the first time in her three Boston Marathons, meaning she started the 122nd edition of the race among the world’s top 60 female distance runners. Guerrette said she hung with some of the top finishers “for about 4 miles” before they pulled away. She said she settled into a pace on mile 10 of the 26.2-mile race and wound up passing some women near the end. Having American runners do so well “says a lot about Americans being an up-and-coming group. Shalane Flanagan (who finished sixth) won the (2017) New York City Marathon. This gives us a lot of confidence that we can compete at the international level” Guerrette said. Guerrette needs to clock a marathon time of 2:45 to earn a spot in the 2020 U.S. Olympic trials. She ran a 2:43.57 at the Maine Marathon last October but the times there didn’t qualify as U.S. Olympic standards. She feels she could have broken the 2:40 mark “in good conditions” on Monday, noting that the times were approximately 15 minutes slower than the normal times because of the weather. The women’s record is 2:19:59. Being the competitor that she is, Guerrette admitted she was “mad” she didn’t turn in a better time. She finished just 5:31 behind 10th place finisher Joanna Thompson. “I want to run faster. I always want to run faster. I’ll use this as motivation,” said Guerrette, who had been running over 100 miles a week in preparation for the marathon. She was elated that Linden won. Guerrette is going to take a week or two off to recuperate. She wants to spend time with her nieces and nephews and the rest of her family. When she returns to training, she intends to focus more on speed work which will probably mean cutting back on her mileage. She wants to run another marathon this fall. “I know I’m a strong runner, but I’ve got to get faster,” Guerrette said. “I’ve got a good aerobic foundation to build upon. “I know I can run faster,” she stressed. The devout Catholic said her religion served as motivation. “I know people were praying for me, but I also prayed for them. It makes it all worth it. It was a great day,” Guerrette said.